This has been a funny sort of week. Lots of gadding about and very little studio time. Last Sunday I went up to Kings Lynn to visit my sister and my Norfolk Niece, and to collect the bulk of the hand crochet textiles from one of our exhibitors for All Saint’s Arts Festival. I spent a lot of Wednesday with Graham at my seaside outpost, making a start on his new India book on Blurb’s Book Wright. Add into the mix a violin lesson, working on the new festival website and finishing four overseas Faculties, and today turned out to be the first day I had time to get out in my studio! 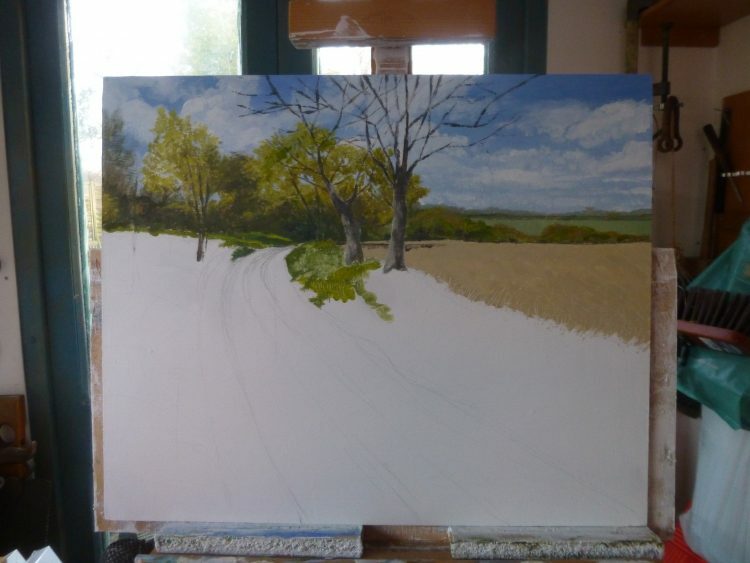 I’m painting the third of my Landlines series at the moment, and this is as far as I’d got by the end of the afternoon.